This is a good hostel all around and one that feels like it really tries to provide for its guests anything they could want. The crowd drawn to Liechtenstein is not the same as the crowd drawn to Munich, and there is a comfortable family-oriented vibe. Lockers are provided for no additional charge, the included breakfast is among the best I've had at a hostel, the staff is friendly and the place is clean. 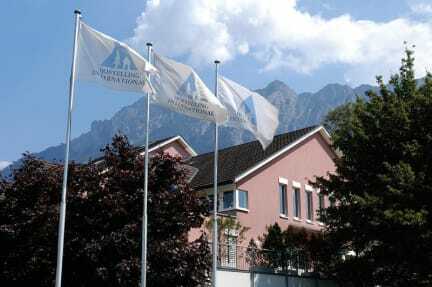 It's located maybe a 20 minute walk from the center of Vaduz. Loved this place. Very sweet staff and full breakfast with some great views. Lovely. Arrived late but they arranged to have an envelope with my name at the front desk, which was much appreciated. Only reason for the atmosphere being the rating it is, is because it is the shoulder season and wasn’t busy at all. The breakfast buffet was probably the best I have ever seen at a hostel and well worth the cost! Excellent staff and everyone was friendly. The rooms were a generous size and I would definitely stay again, without a doubt. Such a peaceful visit at such a cosy hostel! Place was clean, reception staff were helpful and nice. About a 8-10 minute walk to the bus stop/ shops. Wifi wasn't the best in the dorms, but good in dining area. Breakfast had an amazing variety of fruit, bread, meat, cheese. We left early before breakfast was served the next day and so we were given a packed lunch the night before which was so thoughtful! Would definitely recommend and would love to stay again if ever returned to Liechtenstein! Overall clean and comfortable. Showers were good with plenty of hot water. Toilets could do with cleaning more often, but difficult to know if that was the general standard as I was only there for 1 night. Location is good, slightly away from the main road, with a beautiful view. Beautiful location and about as cheap as you're going to get in Leitchenstein.